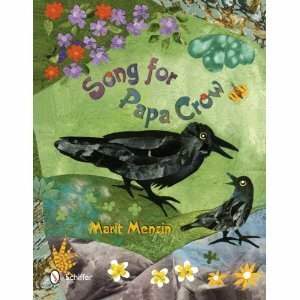 Today’s review is for Song for Papa Crow, written and illustrated by Marit Menzin, published by Schiffer Publishing, LTD. I received an electronic copy of this book from NetGalley in exchange for an honest review. Let me start by sharing some things that I enjoyed about this book. First of all, I liked that the book introduces children to a variety of common North American birds–both visually and through their calls. As an amateur bird watcher, this drew me in right away. It seemed like a great way to help children learn to appreciate birds as well. The section at the back with further information on birds provides a great opportunity for further enrichment and could be used by caregivers and educators for extension activities. The first point when my attention was pulled from the story itself was the introduction of Mockingbird coming to town “for one show only.” It was around this point that the style of the prose began to shift from almost lyrical prose to bland colloquialism. A few pages later, I found myself thinking repeatedly that while the book has potential it really needed a stronger editorial hand. It wasn’t just the text that needed a stronger editorial hand, though. It was the book design overall. Someone should have noticed that poor choice of font. While it’s fun and artsy, it’s difficult to read. And if it’s difficult for an adult to read–then I imagine it would definitely pose challenges for younger readers. I also thought that the placement of text could have been improved–sometimes it seemed awkward in location. But worse were the somewhat sloppy lightened blobs that appear behind the text. While I suspect it was intended to make the text easier to read against the illustrations, it instead looks like an unskilled hand went crazy using the “erase” tool in a graphics editing program. Which is a shame–because Menzin’s collage illustrations are fun. It’s a popular style these days, and while her work doesn’t stand out to me as notable, I still thought that she did a good job. I liked some of the deeper layering and the ways that she achieved softer edges by using specialty paper. I was particularly impressed by her ability to create varying expressions on the faces of her birds. One thing that would have made the illustrations stronger would have been to establish a dominant palette. The overall message of the book is that it’s okay to be who you are is an excellent one. Despite Papa Crow repeatedly telling Little Crow that he was loved just as he is, Little Crow had to test boundaries and face peril before he could believe and internalize that message for himself. In final analysis, I give the book 2 out of 5 stars. It was okay. It had a strong concept and some excellent ideas. Unfortunately, I felt that the execution left a lot to be desired.